Fiona and Paul Abadjian had been walking the beautiful coastal paths of Dorset for more than 20 years before they decided to move there permanently. They were looking to relocate from their thatched cottage in nearby Dorchester and buy a larger property with outbuildings. ‘I have collected Jaguars since the 1970s as a hobby, and we have used them on tours across the world, so they were an important part of deciding the kind of house we were looking for,’ says Paul. In addition, Fiona wanted to keep alpacas, so the house would need to have suitable land for a herd. It took less than a month for the couple to find the property, and less than a minute to be sold on the ‘outstanding’ parkland views. Find our how they accomplished their project before browsing through more real home transformations for inspiration and our extensions page for more practical advice. Straightaway, the couple applied for planning permission, taking great pains to ensure that their plans for the new 1,000-square-feet, double-height section would be sympathetic with the Area of Outstanding Natural Beauty in which it sits. It took eight months and four revised designs to reach a solution with which all interested parties agreed. When permission had eventually been granted, the Abadjians decided to continue living in their Dorchester cottage while they renovated the new property, spending every weekend on site and making hour-long round trips daily to keep the work on track. They started the project in the old part of the house, where the layout was uninspiring and not always practical, with limited headroom in some areas downstairs, and corridors taking up valuable space upstairs. Paul and Fiona wanted to redesign the old house quite radically to make the living areas flow more coherently and to introduce as much light and space as possible. This involved digging out some of the floors to create more height, then changing the emphasis of the building by turning the kitchen and utility into an en suite bedroom. The old living room became a kitchen and the original dining room a spacious hall. The apex of the original roof had created a series of small, awkwardly shaped bedrooms off a central corridor so Paul took the advice of no less than three architects before settling on the idea of knocking out some of the walls to create two large bedrooms instead. Initially, Fiona and Paul planned to repair the roof where tiles had become brittle with age, but they soon realised that the extent of deterioration was so great that it was better to replace the roof altogether. In the process, additional dormer windows were formed upstairs to extend the headroom and admit more light. Some of the original barn doors had been blocked up with bricks, which had been fired in the grounds of the old hall, leaving visible lines where they should have been blended into the original walls. Paul employed three specialist bricklayers to remove some of the bricks and re-lay them in a traditional pattern to integrate them visually, and the whole house was then repointed with lime mortar. 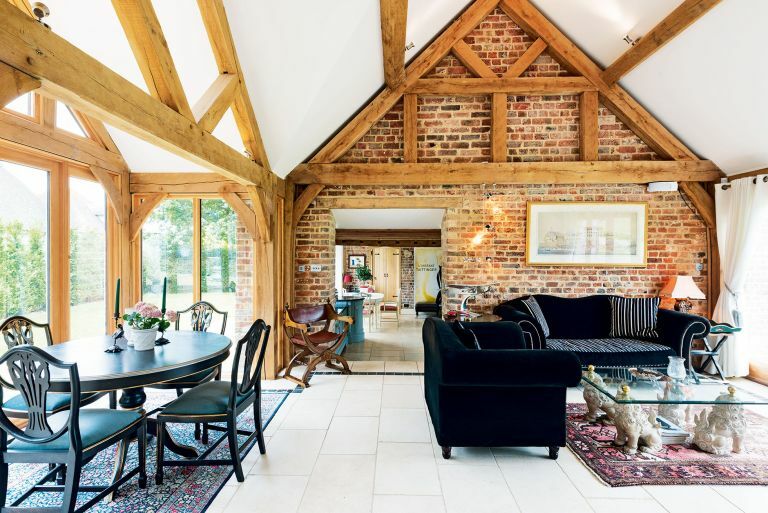 ‘We wanted everything to be done to the highest standard possible and in keeping with the age and style of the original barn,’ he explains. The couple were also keen to embrace certain modern eco-elements within the project, however, particularly an eco heating system with a ground-source heat pump. ‘Originally, we considered having one big ground-source heat pump, but it would have required a three-phase electricity system, which we didn’t have, and it would have cost a further £6,000 to bring in a suitable supply, so we decided to have two smaller pumps set up to be phased so there is no surge,’ says Paul. This turned out to be a rather expensive option. Not only was the ground-source heat pump supplier based in a different area, but its approved ‘local’ contractors were in Cornwall, which was not much closer. The cost of them attending the site was astronomical, and it became clear early on that the arrangement was not satisfactory or viable. The work involved digging six 50-metre trenches in the field opposite the house, and laying coiled pipe runs in each. These pipes then connected into two larger pipes, which transfer the ‘warm coolant’ into the house via two 50-metre pipe runs. Unfortunately this part of the project did not go to plan, and Paul eventually hired a local specialist, Power Naturally, to complete the job. ‘Had we done more research and talked to more people who had ground-source heat pumps, we could have saved a lot of time, money and stress,’ admits Paul. However, the hassle over the pump was more than balanced by the efficiency of Border Oak, the company tasked with building the second phase of the property. The couple bought the house in 2009 for around £730,000. The extension cost in the region of £200,000, while the refurbishment of the existing house cost around £400,000.